Two different data depictions crossed my information stream in the last twenty-four hours. Let’s see what they have in common. First up is this data visualization of PISA scores put together by Michael Marder, a Professor of Physics and the Associate Dean for Science and Mathematics education at the University of Texas, Austin. 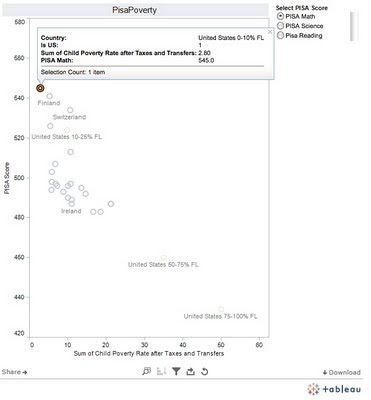 Unlike the usual way these scores are presented (particularly to the American public), this time the U.S. scores are broken down by poverty level. 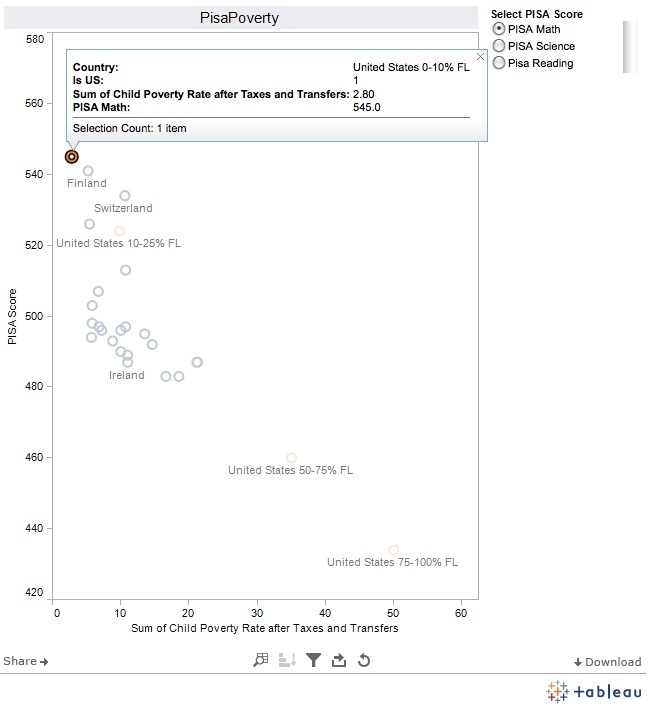 Here’s a screenshot, but you really should explore the interactive Tableau visualization or view the mp4 that Professor Marder narrates. 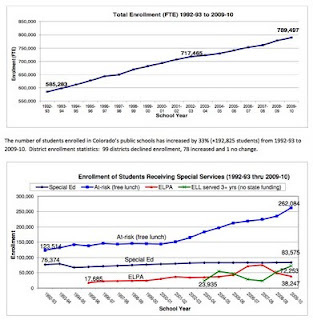 Second was this report (pdf) from the Colorado School Finance Project, depicting the characteristics of Colorado’s K-12 population over the last 17 years. Again, a screenshot, but take a look at the entire PDF as well. Now, regular readers of this blog (are there any of those any more given my recent blogging drought?) know that I have some serious concerns about various aspects of our education system, and I believe there are many changes we need to make to best meet the needs of our students. My current frustration, however, is that I feel most of the talk around education reform at the national, state and even local level is not only about the wrong issues, but also misreads the data and ignores the most important factor affecting what they (not I) believe is the best metric for measuring how our students are learning. For some reason Alex Trebek’s voice popped into my head while thinking about this. Me: I’ll take Education Reform for $1000, Alex. Alex: It’s the Daily Double! How much will you wager? Me: I’ll bet it all on Education Reform, Alex. Alex: That’s very bold. The one issue that well-known national education reformers might actually be able to have an impact on, but also the biggest issue they pointedly ignore. To be clear, I don’t think poverty is our only issue in education. Nor do I think we should use it as an “excuse.” But as long as reformers think that "test scores" and "accountability" are the best path to meeting the needs of our students, then I think they need to get past the rhetoric and address the underlying issue of child poverty. The hypocrisy of misusing data to justify asking for more and more data from schools in order to judge how well we’re doing is stunning. 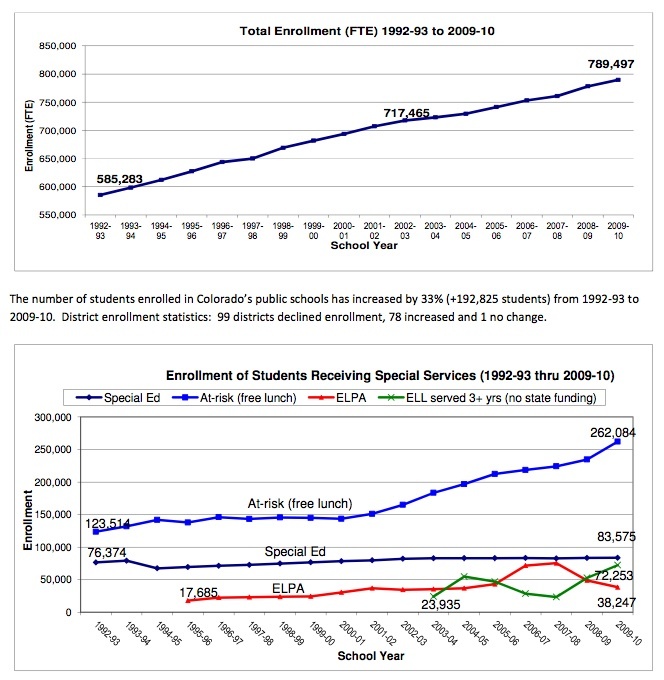 A full one-third of public education students in Colorado are on free lunch. One. Third. Until we address that, please spare me any more discussion of CSAP/TCAP/ACT/PISA/TIMMS/NCLB/RttT/YAA. All of these issues are integrated, and cannot be considered separately. Yes, it's complicated, but I trust smart people are working on these issues. Would love to see a follow-up post on a summary of the findings of these two reports, and how they play out in everyday education. And, as a regular citizen and education lurker, I can only interpret half of the acronyms at the end of your post--so yes, reforms should concentrate on solutions more and lingo less! Politicians and ed reformers don't have the will or skill to deal with poverty, so they point to a few 'beating the odds' schools instead and say, "If they can do it, anyone can do it. Work harder and smarter." Of course it's hard to disagree with 'work harder and smarter' but that mantra masks the underlying reality that you've highlighted here. BakerH - Well, I'd like to trust that smart people are working on these issues, but I guess I'm not sure the ones who are are the ones who have the power to really accomplish much at a level that scales. The first 7 acronyms are real education ones, the 8th - YAA - stands for Yet Another Acronym. Scott - Do they really not have the skill, or do they really think it's about something else? In general, I give folks the benefit of the doubt - I think most if not all of the reformers truly think they're doing the right thing and focusing on the right issues. @Karl: I try to give folks the benefit of the doubt too. I guess what I'm thinking is that we keep trying all of these other things instead of hitting the poverty issue square on. For example, I heard Linda Darling-Hammond state recently that high-performing countries all have better social supports for their children than they do. This is the Geoffrey Canada approach with the Harlem Children's Zone, right? Surround school initiatives with supporting child/family/neighborhood initiatives. It's also worth noting that Gary Orfield's and others' research shows that racial/ethnic school achievement gaps narrowed the most during the 1960s & 1970s War on Poverty. As you note, many/most ed reformers don't focus on dealing with the impacts of poverty on children's learning. So to the extent that they are ignoring those pieces and thus are unsuccessful, their repeated failures would lead me to call them 'unskillful,' regardless of how well-intentioned they are. In other words, we have to ask folks "how's that working for you?' and, if what they're doing isn't working but they persist anyway, there's a lack of skill, understanding, something, isn't there? perhaps all of us are currently impoverished. no? we're thinking poverty is more about a lack of relationship than a lack of money/housing/ged. perhaps it's the very heart of what prescribed learning can do to a community/nation/globe. we become dependent on that prescription. we forget/neglect/miss the critical question in this ed game. it's not about getting better at how and what we prescribe, it's about the fact that we prescribe. pisa is a mind boggler for me. the essence of our global competition, based on school math, something most of us don't use the rest of our lives. and then compared to others (people/nations) rather than to self. i don't see any statistically sound way to do that comparison. even if that prescribed math was worth it. nice push. thank you Karl. These are startling statistics, and a good example of the importance of selecting and comparing appropriate data, and presenting it in a way that makes the invisible visible. I heard on the radio a few days ago that fully 1/6 of all children in the great U S of A are living under the poverty line. Things are not much better here, in "clear, green" New Zealand. We manage to hide our most embarrassing facts in closets where few are likely to look.